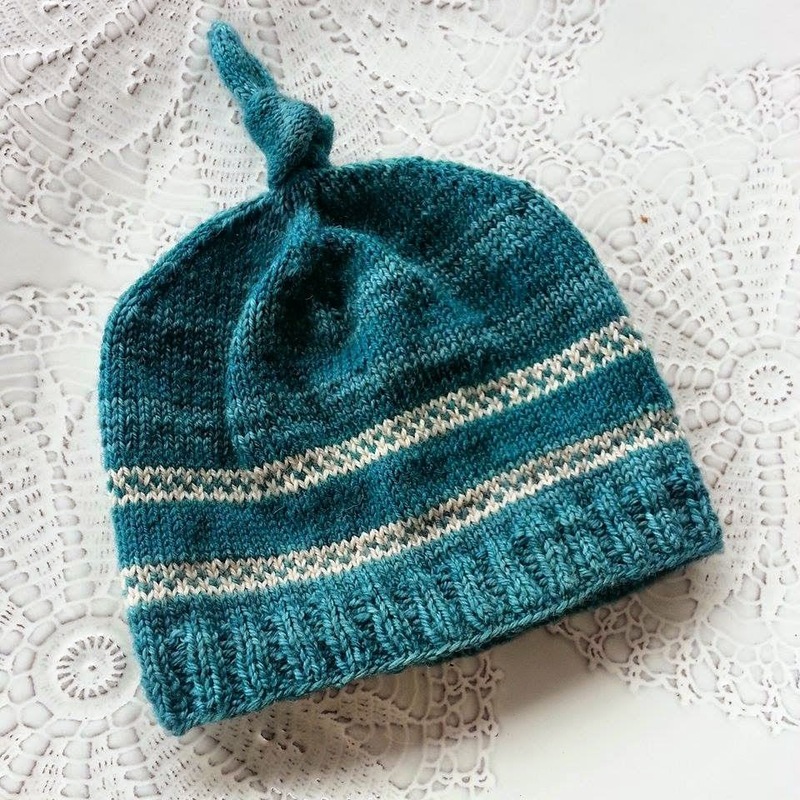 I have this really silly notion, and I'm not sure where exactly it stems from, that I'm not ready to have a baby until I have a hat with a knot in the top. It's like this nesting-for-a-newborn thing that just *has to happen*. I woke up last week in a cold sweat realizing that I didn't have one for this baby. Well, I have the ones used for the previous three babies, but it wouldn't be right to allow this baby's first hat to be one of her older siblings first hats. Another notion that I have no grounds for, but there it is. My previous three babies had regular store bought jersey hats with a knot in the top, which suited the job perfectly. Lotte's actually had two little knots, one at the top of each corner, that almost looked like little ears, or the Great Gazoo. Adorable. I just love that these little hats look like the baby has been freshly picked, no, CHOSEN, off of a magical baby tree somewhere. That little knot just screams "I'm a brand spankin' new little person!" I looked around on Ravelry and there were a few knotty hats on there but nothing like what I really had in mind. Note: Typically, around this time before baby, I get somewhat irrational with the DIY. I don't just break down and clean all the windows, but I come up with work for myself that is seemingly useless. "Yes, Corrie, Write a knitting pattern, when there are already so many available... How about a hat that will fit for only a few weeks? Then you will feel as though you are ready to have a baby." With main Colour, using long tail cast-on, cast on 108 stitches. Place a stitch marker to keep track of your beginning of round. Switch to st st and knit until piece measures 4 inches from cast on edge. Decrease Set up row: k27, place marker. Repeat two more times, and then knit the remaining 27 to your beginning of round marker. You should now have 4 markers with 27 stitches between each one. Remove markers as you come to them, and knit until this top tube of 20 stitches until it measures 5 inches long. It may be easier to switch to double pointed needles for this portion. Once you reach a 5 inch point, k2 together all the way around. Break yarn and draw through remaining 10 stitches, secure and pull remaining thread inside the hat. Row 1: Knit one row in contrasting colour. (i did a jogless stripe method-helpful youtube tutorial for that here.) Do not break yarn between these four rows. Row 3: same as row two, but with contrasting colour first. (white, blue, white blue etc). Row 4: same as row 1.
when these four rows are completed, then break yarn contrasting yarn (white), work more stockinette in the primary colour and if you wish, throw in another section of colourwork. My colour work sections are about 3/4 inch apart. It's a great looking hat and perfect for a new wee head to keep warm. Before big events [weddings, graduations] I always do something big, paint my whole home, plaster the kitchen and lay new flooring. This time? Remodeling a bathroom. I love the hat with the knot and now you are more than ready for the baby, right? so cute! Gorgeous in every way- love the colors! Your hat is beautiful! Nesting mamas do all sorts or irrational things-- just know that you are normal! The hat is adorable A! Good luck with plucking your baby - such wonderful times ahead! I love your reasoning for needing to design a new hat. Sometimes, despite the amount of choice out there, you just can't find the *right* one. Also, it's an incredibly cute hat, so definitely worth the effort!